The Vertical Integration crew found some goods out there amongst the bushes and rocks. Alta had some sweets in the trees for those who wanted to work for it. 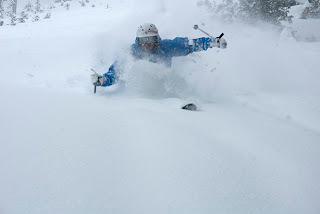 Jon Gurry and I hooked up with Ben Geiger and we went out and zeroed in on the pow. It is still pretty scetchy out with snakes lying just below the surface around the next turn. Ben took a good one right on top of the knee for some reconsideration as to whether he should be wearing knee pads. We all agreed that would have been a wiser move as we all tapped our knee pads with our ski poles. Hell, I was in full impact gear. No major harm though, just a flesh/ego wound. It is starting to look a lot like christmas finally. Snow is getting more regular, and the local bases are starting to accumulate. A little scetchy out in the Snowbasin backcountry right now up high in the northy's due to a weak layer from some stale old stuff below the new dump. We saw a couple of inches of windload on top as well. Just make note. We hit up some low angle trees in the Jungle for some paydirt. $$$$.